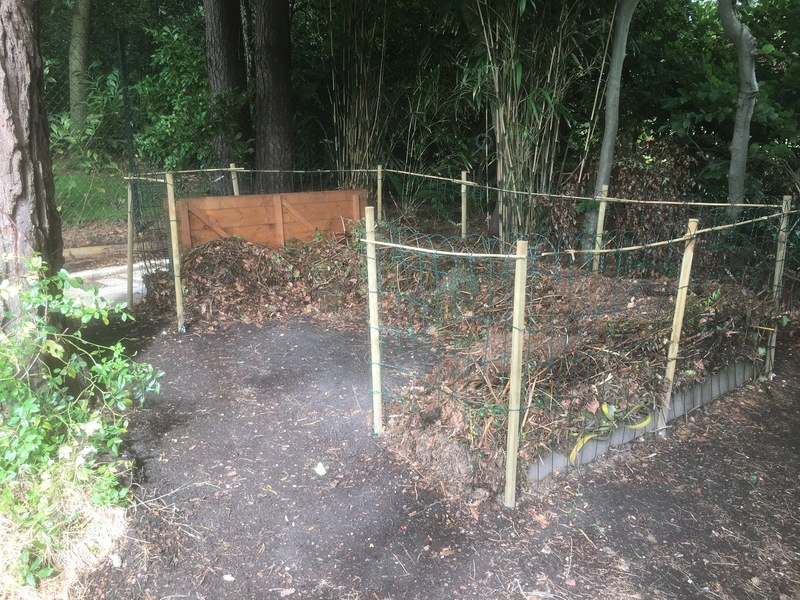 This post should not infer anything about my medical conditions but is rather to do with the recently inaugurated compost heap – a garden feature I’ve been waiting over three years for. 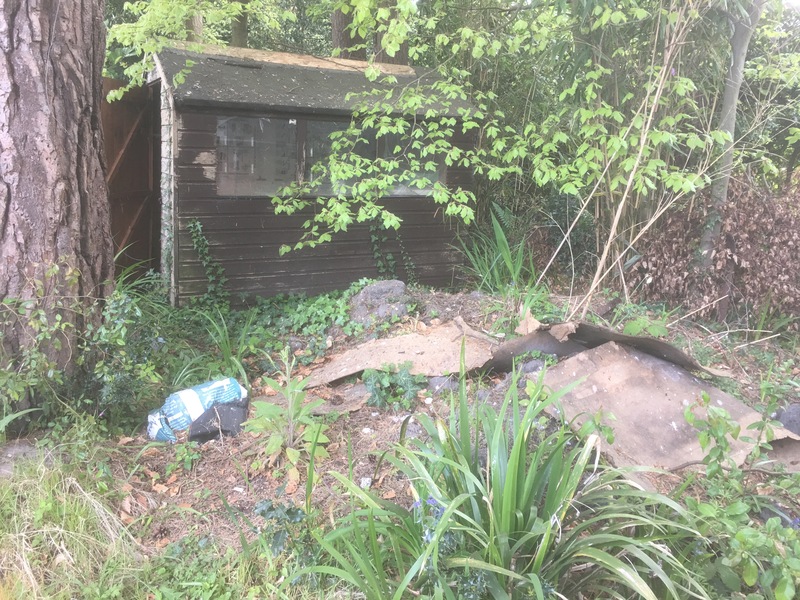 The back of the garden was getting to be a no-go area given the piles of rubbish, weeds, branches, soil and rotting shed that was all taking up the space that the new compost heap is supposed to go. At least being at the back of the garden, it wasn’t terribly visible, but having to look at this mess increasingly often really got on my nerve. There were parts right at the back that were simply inaccessible. It’s taken several weeks to move all this rubbish away, clear the weeds, separate the stones and redistribute the large pile of soil elsewhere. 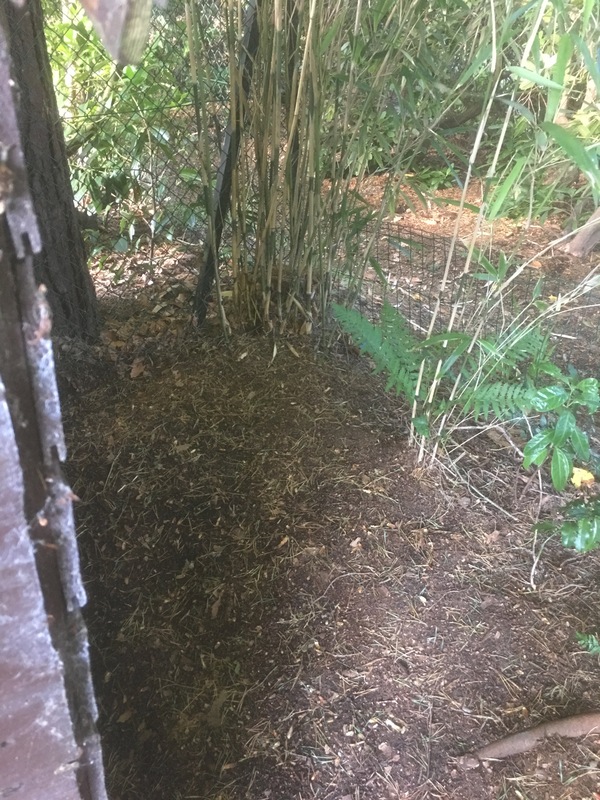 The corner of the rotting shed is just on the left foreground and the small (and controlled) clump of bamboo is right at the corner of our garden, the short fence is the neighbour that backs on to us and the taller fence is next door. It previously wasn’t really possible to stand at the spot where I took this photo and beyond was choked with sticks, branches and leaf litter. To see and be able to get to the corner of the garden is really quite an achievement. With the area finally cleared, it took a trip to the local garden centre to grab some stakes to act as fence posts and some wire mesh fencing roll. I didn’t want just a pile, I wanted an enclosed pile, a compost heap with official edges. The cleared area looks so much larger and more open with all the rubbish gone. The area still needs levelling out some more so the wire fencing sits straight and then there will be a couple of bulk-bags of bark chipping to go around the sides as a path. I’ve left a generous walkway around the sides for air and access. I haven’t decided what I’m going to do right at the boundary and that can wait for another time. Now that the old shed has gone, we got to see the standing it was sat on. 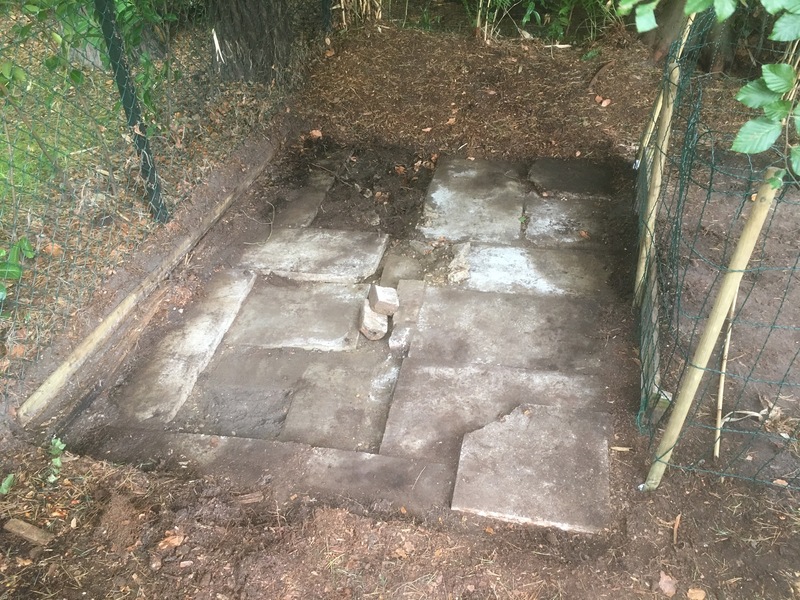 The concrete flags are not your standard paving stones, but seem to be something else, they’re bolted down in layers and we’re not sure if the whole thing was some sort of coal bunker that a shed was subsequently put over the top of. This area will also be most likely bark-chipped and set as a storage area for all those various garden paraphernalia that don’t have a suitable spot anywhere else. Putting the finishing touches to the surround and testing with several barrow-loads of rubbish from a pile elsewhere in the garden means that I am am finally a “proper” gardener, with my own compost heap, all the amateur work done in the borders before is nothing compared to the “serious” gardening that will follow. The official garden compost heap in use, finally. I’m so excited to have a compost heap, it means that finally, I have a single place to put all the garden waste and know it doesn’t have to be moved again, from pile to pile around the garden, it can be dumped there, and left there. 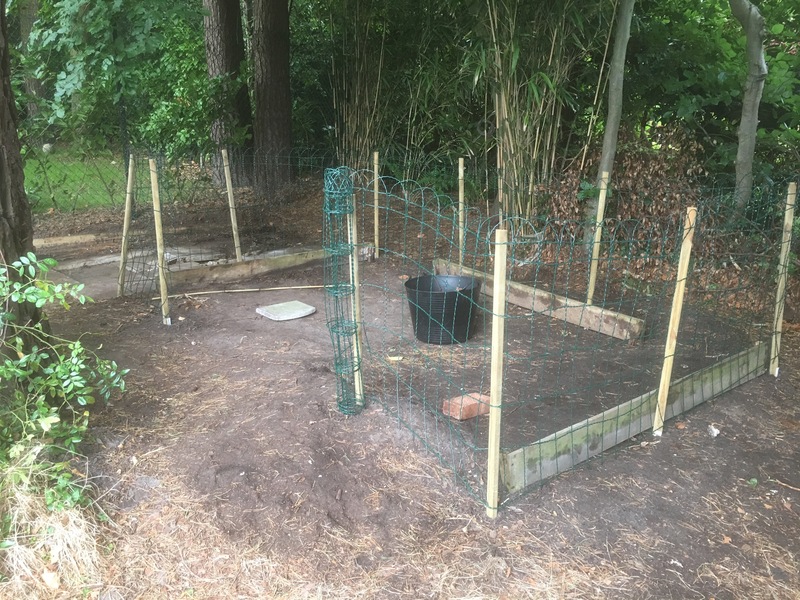 I’ll take people’s advice from the previous post and have three areas within for “new”, “in progress” and “done composting”. After taking all this effort to put up this compost heap, I’m now going to be going around the garden and consolidating all the various piles, into this single one at the back. Clearing the rubbish and creating this heap been the main focus for this season, it’s taken several months end-to-end and is a huge step towards getting the rear half of the garden back to a blank canvas. There is still a great deal of work left to do but at least this corner of the garden is sorted out, I can now move on to the other corner. Sometimes, it’ the simplest things that require the most work. Hello Jean, those are very different attitudes and approaches. The “proper” compost heap allows me to start recycling the cuttings, prunings and clippings from the garden instead of having them all go to temporary places or to the compost bin. In a way, it legitimises having a large pile of rubbish in the garden that I don’t need to apologise for!